Patanjali, the author of the Yoga Sutras is often referred to as the Father of Modern Yoga, but many modern yogis know very little about him, or why he is so revered. Around two thousand years ago Patanjali wrote the wisdom of yoga down for the first time. He wrote it in the form of Sutras, a codified style of writing meant to be memorized and then interpreted, or "unpacked" by one's guru. Today, The Yoga Sutra, also known as Yoga Darshana is considered one of the most authoritative texts on yoga, famous for outlining and elucidating an "eight-limbed" path known as Ashtanga (asht meaning "eight" and anga meaning "limbs"). Admittedly, scholars know little if anything about his actual birth, but nevertheless, as with all teachers of great renown, cool legends abound! The word "Yogini" in Devanagari script. Once there lived a great Yogini named Gonika. She lived alone in a small hermitage where she practiced diligently and meditated happily. One day she caught sight of her reflection in the surface of her water pot. She saw deeply etched lines on her face and white streaks in her hair. She realized that her time on earth was limited and wondered what was the point of all her realizations if she had noone to pass them on to. So she prayed for a worthy student. As she stood in the river one morning offering her prayers to the sun, she contemplated this. She scooped up water from the river in her hands, and as she did so, she saw something flutter lightly down like a feather or a little leaf. It landed in her cupped palms. When she looked down she was surprised at what she saw! Some say she saw a little snake in her palms, homage to the belief that Patanjali is an avatar or incarnation of Adishesha. Some say it was a teeny, tiny child. Either way, she placed the being gently onto the shore and instantly he grew into a handsome, intelligent boy who asked respectfully for permission to be her son and her student. Gonika, of course, accepted. 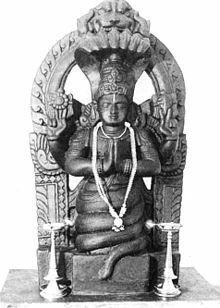 She named the boy Patanjali because he had fallen or floated down (pat) into her prayer-folded hands (anjali). He studied the wisdom of yoga with her until he was a young man and then founded his own school of yoga which emphasized swadyaya or self-study. His teachings have showered blessings and wisdom onto generations of yogis to this very day!